Being a teen mom is hard, no ifs and buts about it. It is not glamorous, it is not fun, it's hard work. It's not cool or fashionable, it's hard. Did I mention it's hard? I should know, I was one. I am now older and wiser but back then I was scared, vulnerable and dare I say shell-shocked. So, here are some helpful tips from three generations of real teen moms to help you along. Just remember though that this is a list made up of my own personal advice, and from two awesome moms that I love and cherish and who have been in the trenches. I believe that their advice and wisdom is just as applicable to young mothers as to older ones as well. Obviously, what helped me may not work for you. Sure, then I thought I was mature, that I had all the answers, that I did not need anyone's help. But I did need it and in a big way. So that's my first piece of advice. Get help from anyone willing and able to do so. This help may come in many forms. It may be advise, it may be a pasta casserole left on your doorstep, an hour of free babysitting so you could take a shower, you get the idea. Accept it with a smile and a big thank you. Whether that is high school or college. Don't throw away your education. Most high schools and college campuses now offer daycare. Take advantage of this service to finish what you have started. To get ahead in life you need a good job and to get a good job you need an education. Not only will you be able to provide for your child this way, you will be a role-model and a shining example of what hard work and determination can achieve. It won't be easy but you will be glad you stuck it out. In other words, legalize matters. If you're not married and want to be, then get it done as soon as you can. If you don't want to stay together with your partner, then don't, but in any case get the baby's father on the birth certificate. This will protect you and your baby in the future. It will also help you get child support if the need arises. Nothing is more important than health. Without it you have nothing. So make sure you take care of yourself and your baby. Go and see a doctor to get checked out, get vitamins, supplements (both to treat and prevent ailments) and monitored. Medical care is free in most states, so there's no need to worry about the costs. Make sure to go to all your appointments and to eat healthily and exercise as well. Once the baby is born, don't forget to have all the immunizations and checkups! Sometimes all you want to do is pull your hair out. At other times all you want is a shower and a bed. In an ideal world you would have this but in reality, the baby has an ear infection, dinner needs to get cooked, the house needs to get cleaned and all you want to do is scream. In cases like this, take a deep breath, go outside and scream your lungs out and then go back inside and smile. Just remember this too shall pass. Be patient. In all the tumult of coping as a young mother, it may be hard to remember that you have the life of a little being in your arms. This time is precious and you will look back and cherish it. This is the time to bond with your baby. Whether this is done through breastfeeding or bottle-feeding, holding and cooing or co-sleeping. The way is indifferent, the action is key. I can't stress this enough. Sleep when the baby sleeps. I know it's easier said than done but really do take advantage of the quiet to doze off. Don't clean the house, don't make dinner, don't watch tv, sleep, sleep and sleep! You won't be able to be there for your baby if you're exhausted. By this I mean is hold and kiss your baby as much as you want! Don't let busy-bodies tell you otherwise. Go ahead, enjoy your baby. This is the time to do so. 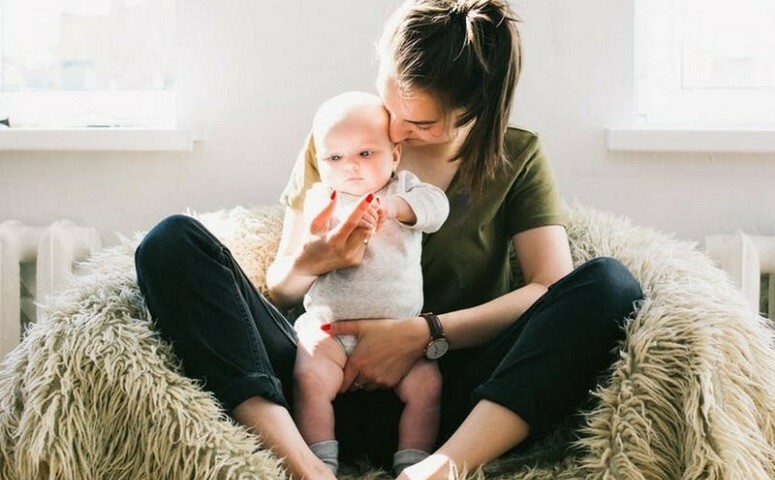 It doesn't matter that you're young, you are still a mom and you and your baby need each other. Teen Mom - You Can Do It! Coping as a new mother is never easy, especially when you're young. We all imagine an ideal life as mothers no matter how old we are, the reality is harder to swallow, so don't be too hard on yourself. Remember no one is perfect and no one gets handed a “How To“ book on how to be a good mom or just a plain run-of the-mill mom. You just have to do the best that you can and hope that is good enough.